Development Description: Construction of a single unit two storey dwelling (with single storey wing to west) together with on site waste water treatment unit, new vehicular entrance and all associated site works. Development Description: Construction of 6 no. two-storey semi-detached dwelling houses, the construction of a site entrance, connection to public mains water, connection to public foul sewer, and all associated ancillary works. Development Description: Demolition of existing detached domestic garage, construction of split level style dwellinghouse, revised communal entrance and ancillary site works. Development Description: The importation of soil and stone for the raising of an agricultural field in order to improve the agricultural output of the field. Development Description: Partial demolition of existing dwelling including rear balcony, refurbishment, alterations to elevations and construction of extensions and balcony to dwelling, new retaining wall to boundaries, upgrading vehicular entrance and all associated site works. Development Description: Extension to existing dwelling, revised entrance and associated works. Development Description: Construction of new dwelling house and detached garage (change of design and repositioning of house on site to that granted under Planning Ref: 08/6301 and extended under Planning Ref: 13/6006), new wastewater treatment unit and percolation area and all associated ancillary siteworks. Development Description: (a) Extensions to side and rear of existing single storey dwelling house, (b) decommissioning of existing septic tank and installation of new mechanical aeration system and soil polishing filter, and all ancillary site works. Development Description: Alterations and extensions to permitted pharmaceutical production building, New Product Technology Laboratory (formerly known as Organic Synthesis Plant 2). The works include the following; i) a two storey extension at first floor level on the north west side, ii) a two storey extension at second floor level on the east side iii) a one storey extension to the east and west of the existing plant room at third floor level, iv) a one storey vertical extension of the existing lift at third floor level, v) a one storey vertical extension of the existing north western stairs at second floor level, vi) a four storey extension at ground floor level to the south, vii) an external drum warmer pad with canopy over the south and viii) minor elevational changes at production facility. The proposed development is covered by an existing Industrial Emissions Directive Licence No. P0013-04. The development refers to a modification to an establishment to which the Major Accident directive applies. Development Description: Change of use of existing building from office to veterinary consultancy rooms. Development Description: (a) Retain existing underground concrete slurry storage tank (b) Retain existing cubicle house/easy feed extension (c) Construct a new animal house over aforementioned underground slurry storage tank. Proposed development to include external ancillary concrete. (d) Erect a new 19 tonne meal bin. The above to include all associated ancillary site works. Development Description: Demolish existing derelict timber dwelling and construct a one and a half storey dwelling house and all associated site works. Development Description: Construction of dwelling (change of plan to that permitted under planning permission Reg. No. 14/6554 and An Bord Pleannála Decision Reference PL04.244507) and all associated site works. Development Description: The extension and renovation of exiting stone dwellinghouse, installation of a proprietary wastewater treatment system and associated site development works. Development Description: To demolish existing dwelling house and to construct a dwelling house and garage with related site works. Development Description: Construction of part single storey/part storey and a half dwellinghouse, detached domestic garage, treatment unit and percolation area, vehicular entrance and all ancillary works. Development Description: Construction of prefabricated classroom and toilets for use as a pre-school, new internal entrance, connection to existing services together with all other site works. Development Description: Construction of 7 no. dwelling houses consisting of 6 no. 4 bedroom semi-detached dwelling houses and 1 no. 4 bedroom detached dwelling house and all ancillary site works. The proposed development is a change of plan from that permitted under Cork County Council Planning Reference 10/6298 and An Bord Pleanála Reference PL 04. 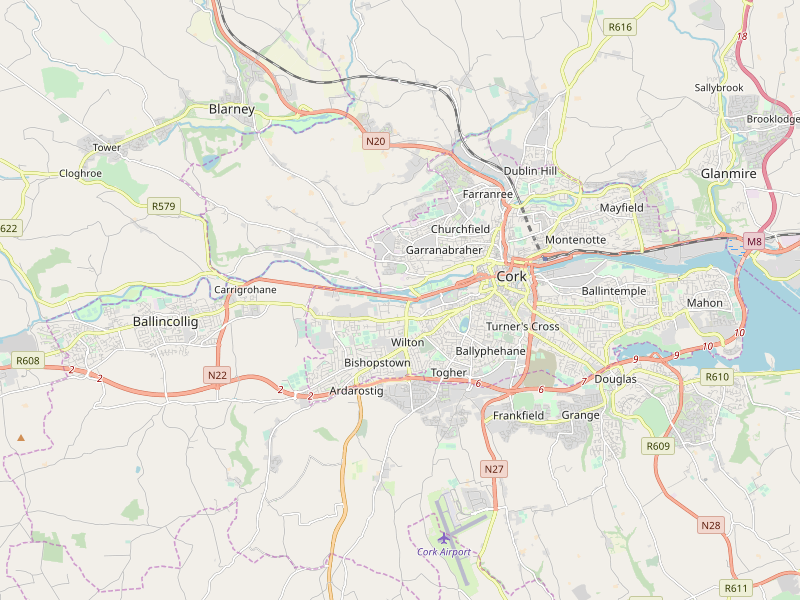 238079, (Subsequently extended under Cork County Council Planning Reference 15/6939) and will result in the construction of 3 no. additional dwelling houses. Access to the proposed development will be via the existing estate entrance and internal road network of Crawford Woods residential development. Development Description: The construction of a car park comprising 26 no. car parking spaces and set down area serving Scoil Bhride Primary School Crosshaven and St. Brigids Church (Protected Structure) including a new vehicular access and the construction of a pedestrian footpath on Upper Road, and all associated ancillary development works including traffic calming, signage, bollards, road markings, fencing and site development works. Development Description: Construction of a vehicular access to the existing Presentation Convent including the partial removal of an existing wall and the construction of a low level stone entrance wall on to the access road serving St. Brigids Church (Protected Structure), the construction of a pedestrian crossing on the R612 road and the provision of new pedestrian access on to the R612 to serve the existing Colaiste Muire Secondary School and all associated ancillary site development works. Development Description: Construction of new single-storey dwelling, domestic garage, new site entrance with vehicular access form public road, domestic waste water treatment system and all ancillary site works. Development Description: Construction of the following i) two storey dwelling including single storey link to garage, ii) adjoining single storey garage, iii) on site waste water treatment unit, iv) new vehicular entrance and all associated site works. Development Description: Construction of dwellinghouse, domestic garage, new entrance together with all other ancillary site works. Development Description: Construction of 58 no. dwelling units comprising of 8 no. 4 bed semi detected units, 32 no. 3 bed terraced/end of terrace units and 18 no. 3 bed duplex units [across 3 no. 3 storey blocks]. The existing vehicular and pedestrian access serving the site is being moved eastwards and is located to the north of the site onto Ferney Road. A new vehicular access onto Ferney Road is also proposed to facilitate the existing dwelling known as ‘The Meadows’. Permission is sought for the demolition of the existing farming related structures/sheds comprising a total area of 790.9sq.m. Permission is also sought for 128 no. car parking spaces. Permission is sought for the development outlined herein including but not limited to associated landscaping, play areas, bicycle parking, drainage and associated site works. Development Description: A residential development comprising the construction of 75 no. dwelling houses, a creche and all associated ancillary site development works including access, parking, footpaths, drainage, landscaping and amenity areas. The development includes the creation of a new vehicular access road along the sites eastern boundary via Ballytrasna Park to service the site. The ancillary site development works consist of the diversion and undergrounding of the existing MV (10KV/20KV) ESB electrical cables. Development Description: Construct part single storey and part one and a half storey dwelling, to make alterations to the existing entrance by moving it east, to construct a new 2.0m. high block wall separating the site from the existing bungalows in Millbrook Close and House No. 15 Glashaboy Woods. To connect the foul sewer to the existing foul sewer in Millbrook Close and all associated ancillary site development works. Development Description: To erect a single storey dwelling with attic space and septic tank. Development Description: To construct a dwellinghouse, to install a septic tank and to carry out all associated site works including alterations to existing entrance and construction of new combined entrance to serve proposed and existing dwelling. Development Description: The construction of a dwellinghouse and domestic garage and associated site works. Development Description: The installation of a treatment unit and polishing filter to serve the existing dwelling. Development Description: Alterations and extensions to existing dwelling incorporating (a) single storey extension to the front of the existing single storey accommodation to the western side of the dwelling to provide a granny flat (b) two storey accommodation to the eastern side of the dwelling, (c) minor alterations to elevations, (d) detached domestic garage to the rear of the site, and all associated site works. Development Description: The construction of cattle shed to include slatted slurry tank and straw bedded area, a meal bin and all associated site works. Development Description: Construct (i) single storey granny flat extension (ii) install two dormer type windows on first floor of existing dwelling (iii) replace septic tank with a treatment unit and polishing filter (iv) and associated site works, all to existing dwelling. Development Description: To erect a dormer type extension to an existing single storey cottage. The development also includes re-structuring the roof on the cottage to provide habitable space in attic, modification to windows and doors on the cottage, modification of existing vehicular entrance, construction of a domestic storage building, installation of a sewage treatment system to replace existing septic tank, and all associated site development works. Development Description: (a) Renovate an existing cottage with minor elevational modifications (b) extend the existing cottage with a single storey extension (c) decommission an existing septic tank and install a new waste water treatment plant with polishing filter (d) retain the existing agricultural entrance and create a new site entrance with driveway/parking/service yard including all associated site works. Development Description: a) The construction of a cattle underpass beneath a public road incorporating a soiled water storage tank, b) the construction of 2 No. new agricultural entrances to replace the 2 No. agricultural entrances required to be closed to facilitate the construction of the cattle underpass and c) all associated site works. Development Description: The construction of 9 no. dwelling houses consisting of 8 no. 4 bedroom semi-detached dwelling houses and 1 no. 4 bedroom detached dwelling house and all ancillary site works. The proposed development is a change of plan and change of house type from that permitted under Cork County Council Planning Reference 15/6813 and will replace of 8 no. 2 bedroom apartments, 2 no. 4 bedroom semi-detached dwelling houses and 1 no. 4 bedroom detached dwelling house. Access to the proposed development will be provided via the junction from the Killumney Road and internal road network which was permitted by Cork County Council Planning References 15/6813 & 17/4270. Development Description: To erect a 2 storey dwellinghouse, detached garage, installation of an on-site sewage treatment system, and all associated site development works. Development Description: The construction of a 3 storey building, bin store, bicycle store and all associated site development works. The proposed building includes 1 no. childcare facility at ground floor level (change of plan from 2 no. childcare facilities previously permitted under Planning Reg. No. 14/6533) and 3 no. duplex apartments at first and second floor levels with balconies and a communal roof terrace at first floor level. The proposed duplex apartments will be accessed via an external walkway. Development Description: Partial demolition to the northern side of existing dwelling, with the construction of a i) part single storey/part two storey extension in the place of the demolished section of dwelling (to north and east), with internal alterations to suit, and with ii) elevation changes to the western elevation of the existing dwelling, iii) a new packaged waste water treatment system and polishing filter and iv) a new domestic shed to the southerly side of the property and with all ancillary site development works. Development Description: (1) Retention and completion of balcony to rear of existing dwelling. (2) Permission to replace first floor window with patio door on rear elevation of existing dwelling. (3) Permission to plaster (smooth plaster) brickwork on front elevation of existing dwelling and (4) Permission for external stairs. Development Description: A two-storey dwelling and detached garage together with associated site services and site development works. Development Description: Construction of entrance onto farmland from public road and associated works. Development Description: Construction of new storage together with upgrading of existing entrance and all associated site works. Development Description: Construction of dwellinghouse, domestic garage, proprietary treatment unit, polishing filter and new entrance (change in house design to that permitted under Planning reference number 10/5912 and 16/5057). Development Description: To (a) demolish existing garage and construct new garage to rear of existing dwelling, (b) construct extension to side of existing dwelling house. Development Description: Construct dwelling, domestic garage, effluent treatment system and associated site works. Extension of Duration of Permission 14/4830. Development Description: The development of 1no. single storey CNG (compressed natural gas) compressor installation with a floor area of 23m2, 1no. covered shelter with a floor area of 12m2 and 57m of 2.9m high boundary wall and associated ground works. Development Description: (a) Construct an extension to existing manufacturing building, (b) demolish existing pump house building and (c) all associated ancillary works. Development Description: Alterations to elevations, construction of first floor extension to existing single storey dwelling and construction of bay window extension to front with balcony over, construction of a new driveway and associated works, and the replacement of a septic tank. Permission for retention is also sought for: The refurbishment, extension and change of use of an existing garage building into a ‘Granny Flat’ residential Unit that accommodates one bedroom, one WC, kitchen facilities and a boiler room/store. Development Description: Retention of the change of use from domestic garage to ancillary living accommodation/habitable space and to retain altered front garage door. Development Description: To construct a single storey rear extension & all associated site works. Development Description: Construction of an agricultural shed. Development Description: Retention for (a) existing 2 no. 10m high timber poles together with associated dishes and antenna and ground-based equipment and fencing (partially granted under planning reference number W/1091/84, and Permission (b) to erect a 20m lattice tower together with associated antennas, dishes, equipment cabin and security fencing. Development Description: Alterations to include changes to the front elevation and the addition of signage to the commercial property. Development Description: For alterations and the construction of a single storey extension to the side and a ground floor extension to the rear of dwelling house with a dormer window extension over same. Development Description: Demolition of existing rear non period annex to the existing single storey detached dwelling, refurbishment and alterations to the existing detached dwelling, construction of a new two storey rear extension with connecting entrance link and canopy, and upgrading the existing vehicular entrance, boundary treatments to existing road side boundary and existing site boundaries, upgrading of existing septic tank to a new septic tank, upgrading of existing well to a new potable well and all associated site works. Development Description: Proposed works to an existing dwelling house to include the demolition of side and rear extension and rear decked area, material alterations to existing elevations and roof, and the construction of a dormer roof window, entrance porch and a single storey rear extension, and all associated landscaping and site works. Development Description: An extension of duration for a period of 2 years, of previously granted Planning ref no. 15/5474 as follows, (A 3 year permission for 4 temporary classrooms (circa 304sq.m). 2.4m high post and mesh fenced enclosure, all associated drainage to include new drainage connections to existing foul and surface water sewers, extensions of existing access road within site. Fingerpost signage at entrance to grounds, school sign on east elevation of classroom, site works and services. Development Description: Retention of existing extensions, alterations and granny flat (including change of use of attached garage and overhead rooms to self-contained granny flat. Granny flat to be used as separate dwelling unit).